With architecture painstakingly restored in the spirit of Early America, each of Doneckers' three country Inns evokes a historical intrigue all its own. The Guesthouse, where visitors check-in, features cozy chambers to luxury suites with a fireplace and Jacuzzi. Relax in the parlor, exquisitely appointed with fine furniture by Harrod's of London. The 1777 House is the restored home of an Ephrata Cloister householder. The Homestead is the original Donecker family home. Each morning is your opportunity to savor our renowned granola as part of your deluxe Continental breakfast. Each evening is your chance to dine at The Restaurant at Doneckers- acclaimed for its innovative Nouveau French-American cuisine, prepared by a former chef of Philadelphia's world-famous French restaurant, Le Bec-Fin. During your stay, you also can enjoy the rest of the vast Doneckers Community, including a three-floor, upscale fashion store, filled with over 1,900 designer brands for women, men, children and the home; our Christopher Radko Christmas Gallery, complete with Pennsylvania's largest selection of Radko creations; and our Fine Furniture Galleries, a renovated historic factory building that houses over 48,000 square feet of the finest furniture in the world. It is a truly extraordinary combination: the pastoral beauty of Lancaster County; the small-town charm and history of Ephrata; and a 40-year-old family business. …all presented with the best small-town traditions of hospitality and attention to customer service. 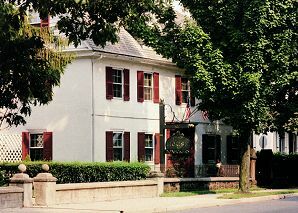 This and other Lancaster County Bed and Breakfast Inns can be found here in The Register.